This recipe for crack chicken gives instructions for the Instant Pot or the slow cooker. Instead of that infamous ranch packet, I use flavorful herbs and spices. Add the chicken, broth, and spices to the crock pot. Set on low for 6 hours or high for 3 hours. Shred the chicken with 2 forks when finished. 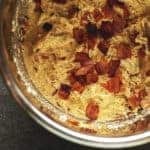 Stir in the cream cheese, cheddar cheese, and the crumbled bacon. Add the chicken, broth, and spices to the Instant pot. Close the lid, set to sealing, and set the timer to 8 minutes high pressure, followed by a 10 minute natural pressure release. Remove the chicken from the pot. Discard all of the liquid except 1/2 cup. Return the chicken back to the pot and shred with 2 forks.